DR Congo (MNN) — The Democratic Republic of the Congo is the second largest country in Africa and home to 83 million people. It is also the stage for “Africa’s world war”. Six million people have died from an ongoing conflict with multiple contributing factors. It all started in 1994 when many Hutus from Rwanda fled to eastern DR Congo after committing mass genocide. From there, conflict ensued when issues of government representation flared up. It was also made worse by fighting over natural resources. Militia, citizens, and UN peacekeepers still clash in the east today, and an approaching election season is reheating tensions. 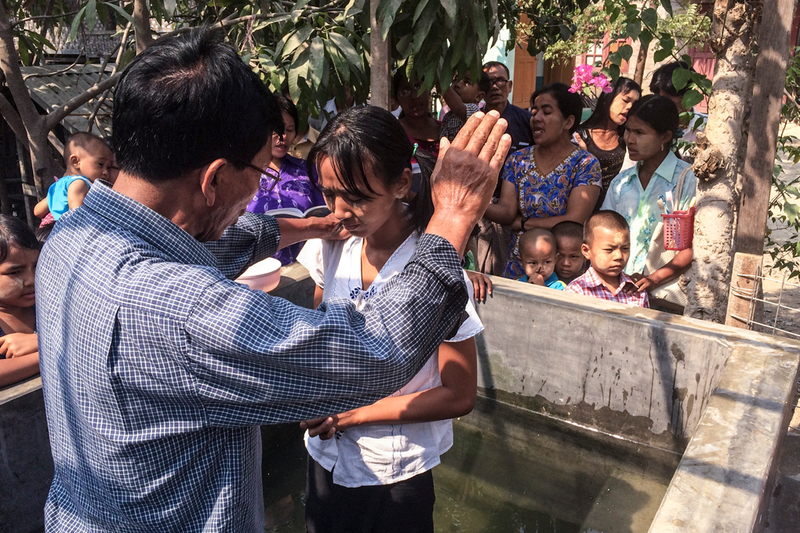 In this hostile, blood-soaked region, is there any hope for the spread of the Gospel? Wycliffe Bible Translators says “yes”. The ministry is currently working on a translation of the New Testament in the Tembo language. 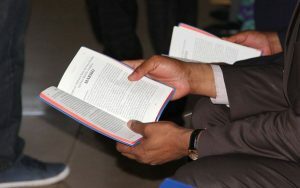 Translators have worked to make God’s Word available in this language for over two decades. But because Tembo speakers live in eastern DRC, the conflict has taken its toll on translation efforts. Jon Hampshire with Wycliffe says, “It’s a very complicated situation in eastern Democratic Republic of the Congo. They had to move their office to the town of Goma because of the insecurity, and yet they just kept working and faced really a lot of hardship because the infrastructure in the country had broken down. It was hard to get medical care for their family. And yet, they considered this work so important that they just kept working. 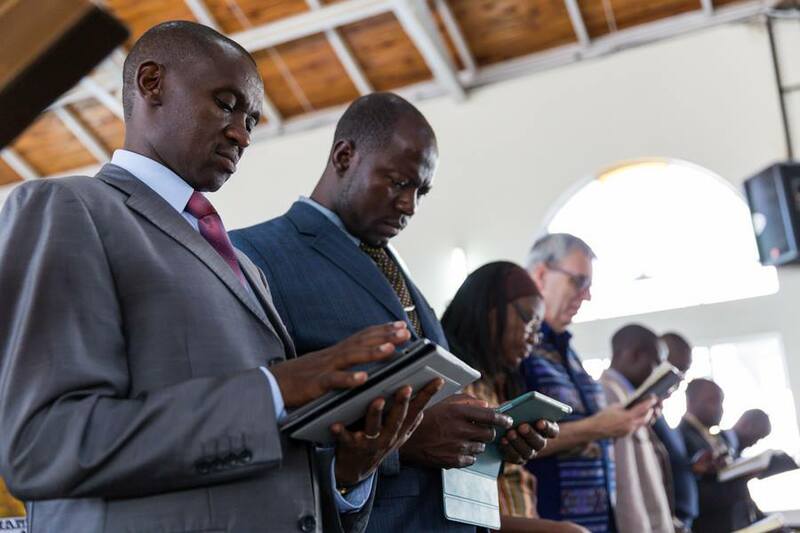 After two decades, Wycliffe finally had a dedication service for the Tembo New Testament in October 2017. “They set up a whole system of distribution, which basically involved pastors and other church leaders taking boxes of books of the New Testament to as many villages as they possibly could,” Hampshire shares. The vice governor is not a Tembo speaker himself. However, he was thrilled to learn at the dedication that Wycliffe is going to start working on Scripture translation in his language next as well. The Tembo community still would love to have the entire Bible available in their language. They currently have Genesis and the New Testament. To accomplish a complete Scripture translation will take more time, dedication, and resources. Click here to learn more about Wycliffe’s work in DRC! 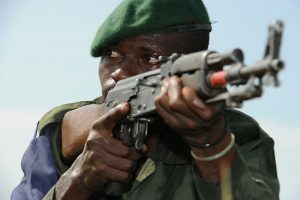 Please pray for true peace in eastern DR Congo. Ask God to open doors for the Gospel to spread throughout the region in all languages. Thank Him for the dedication of the Tembo New Testament. Pray for the resources and people to also translate the Old Testament into the Tembo language.